FLIPR® Calcium Assay Kits are the platform of choice for measuring changes of intracellular calcium for drug discovery and basic research. Built as the most comprehensive portfolio of calcium reagents, the kits deliver pre-optimized, homogeneous, fluorescence-based formulations to expedite assay development and screening of GPCR and ion channel targets. When utilized in the quench-free (QF) formulation, the dye is ideal for quench sensitive targets or assays requiring multiplexing of calcium-flux and luminescent assays within one well. A novel fluorophore that amplifies the assay signal window while leveraging the superior masking technology used in the FLIPR Calcium 4 Assay Kit to reduce background fluorescence. In addition to the above assays, receptors with low receptor expression and other targets that give a small calcium response are candidates for this kit. Contains a revised proprietary masking dye with higher light extinction in the extracellular solution to significantly reduce background and increase signal window. It is more inert and reduces compound interference. Successful targets include calcium channels, chemokine receptors, and transiently transfected receptors. Improves signal window with unique fluorophore that enables detection of chemokines. Quench technology designed for targets that have proteins or peptides as agonists. FLIPR Assay Kits from Molecular Devices, LLC employ a quenching dye to reduce background fluorescence and improve the signal-to-noise ratio. The patented quench technology is offered to drug discovery and life science researchers exclusively by Molecular Devices, through the purchase of FLIPR Assay Kits. Molecular Devices offers the broadest selection of calcium mobilization assays to address diversified biological targets. Figure 1: Comparison of fluorescent signal response to calcium flux during carbachol agonism of Muscarinic M1 receptor in CHO M1 cells. This illustrates the signal-to-noise ratios offered by homogenous assay run in media using the FLIPR Calcium 6 Assay Kit. Combining a novel fluorophore and the proven quench technology, the FLIPR Calcium 6 Assay Kit shows the highest signal to background ratio. 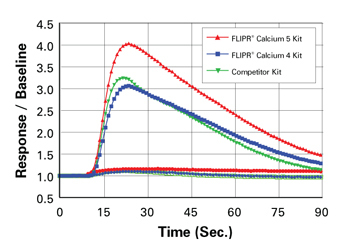 Figure 2: When performing no-wash assays (initial media removal, replaced with assay buffer, no-wash after dye-loading) the novel fluorophore of FLIPR Calcium 6 Assay Kits demonstrates highest signal to background ratio. Obtain same high quality performance in presence or absence of masking dye. Figure 3: Novel fluorophore is more resistant to organic anion exchange proteins found in some cell lines. 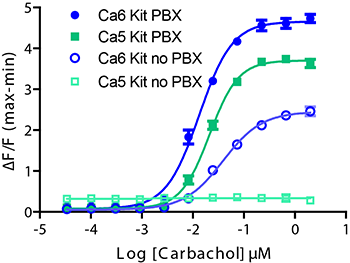 No signal seen when using FLIPR Calcium 5 Assay Kit without probenecid (Ca5 Kit no PBX). With FLIPR Calcium 6 Assay Kit (Ca6), the signal is smaller without probenecid, however EC50s are conserved and Z’ still greater than 0.5. Figure 4: Comparison of fluorescent signal response to calcium flux during acetylcholine agonism of Muscarinic M1 receptor in CHO M1 cells. This illustrates the signal-to-noise ratios offered by various FLIPR Calcium Assay Kits with quench technology. Combining the novel fluorophore and the proven quench technology of the FLIPR Calcium 4 Assay Kit, the FLIPR Calcium 5 Assay Kit shows higher signal to background ratio than prior kits. 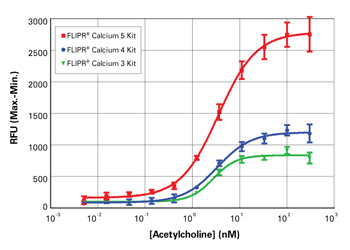 Figure 5: Antagonism of calcium flux in response to EC80 acetylcholine in CHO M1 cells evaluated with the FLIPR Calcium 5 Assay Kit and the FLIPR Tetra System, demonstrating a large signal window and performance consistent with previously published data. 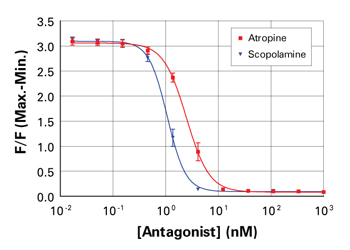 Figure 6: Signal trace on the FLIPR Tetra System of ATP agonism of PY receptor in HEK 293 cells compared using different calcium mobilization kits. Consistent EC50 values among all kits were recorded with no increase in background. The signal window was substantially larger for the FLIPR Calcium 5 Assay Kit. 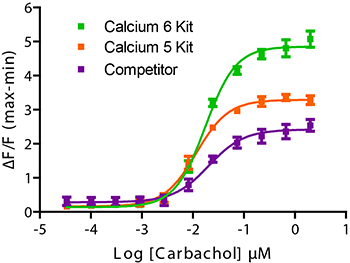 Figure 7: Reduced background in the FLIPR Calcium 4 Assay Kit (orange) leads to improved ΔF/Fo values compared to the FLIPR Calcium 3 Assay Kit (green) in an assay with especially small calcium response. Assay: Endogenous response to carbachol in HEK 293 cells in a 384-well plate, 10,000 cells/well, media removal before assay on the FLIPR Tetra System. 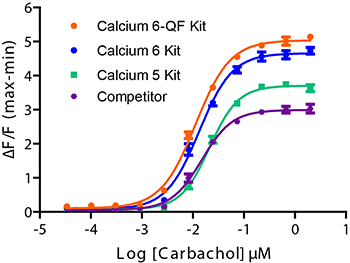 Figure 8: In many cases FLIPR Calcium 4 and Calcium 3 Assay Kits perform equally well while at the same time outperforming competitive kits as shown by a Molecular Devices customer in the data above. Assay: Undisclosed non-adherent cells stimulated with a protein activator, no media removal, assay was done on a FLIPR 3 instrument. Figure 1: FLIPR Calcium Assay Kits utilize a calcium sensitive dye that is absorbed into the cell’s cytoplasm during incubation. Upon ligand-receptor binding, intracellular calcium is released, binding with the dye, thereby increasing fluorescence intensity. All FLIPR Calcium Assay Kits utilize an extracellular masking technology to block background fluorescence and increase your assay’s signal window. 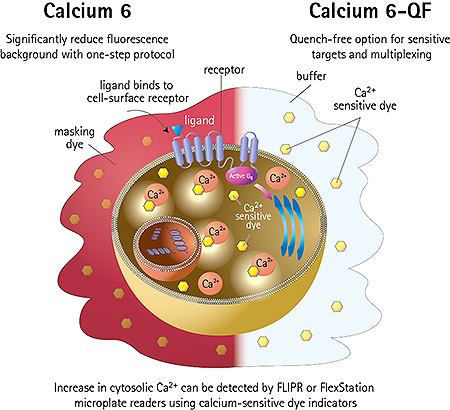 The FLIPR Calcium 6-QF Assay Kit is the one exception, enabling assay performance without a masking technology, making it an ideal choice for quench-sensitive applications such as multiplexing with luminescent indicators.